Passat GP Thunder Halogen Bulbs. We have experts that can assist. Please scroll down to see which size bulbs your vehicle uses. Looking to greatly increase the look of your vehicle without having to spend hundreds of dollars to do it? We have the solution with GP Thunder Halogen Bulbs. We offer two different temperature colors 7500k, and 8500k. 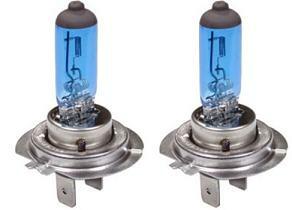 These are the best bulbs you will ever get, and they are the best xenon white bulbs on the market. Quality is never an issue with this supreme quality light bulb. GP Thunder bulbs are made of fused quartz glass in order they may produce maximum power with a smaller bulb. Turn heads like never before with GP Thunder 7500K & 8500K Halogen Replacement Bulbs. What does a HID look bulb replacement do? 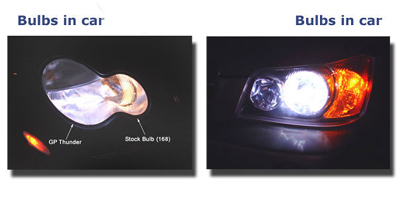 There are many car enthusiasts that desire the white, or blue HID (high intensity discharge) look. Many people go to great lengths to achieve this desired look, from buying a HID conversion kits to retrofitting projectors to attain the desired beam pattern. There are very many alternatives to achieving the HID look, and many choose to take the cheaper route which is the HID look bulb replacement. 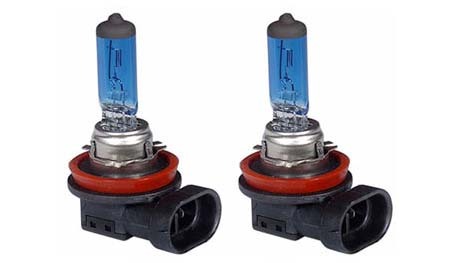 These HID look replacement bulbs are a great alternative to actual full HID conversions, but due to the fact that they are merely replacements they are not much brighter than stock. The reason that they may appear much brighter is due to the fact of their color temperature much resembles that of the color of daylight. If you are looking to merely change the color of your headlight from the dull yellow to a bright white then this bulb replacement is a great alternative for you. *Uses one bulb for low and high beams. **Only if your vehicle has halogen bulbs stock, not HID bulbs.